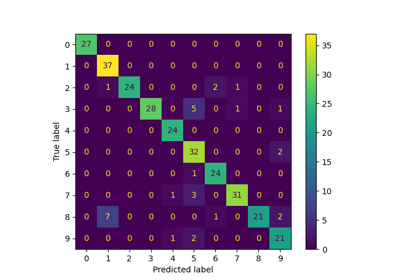 This model is similar to the basic Label Propagation algorithm, but uses affinity matrix based on the normalized graph Laplacian and soft clamping across the labels. Clamping factor. A value in (0, 1) that specifies the relative amount that an instance should adopt the information from its neighbors as opposed to its initial label. alpha=0 means keeping the initial label information; alpha=1 means replacing all initial information. The distinct labels used in classifying instances. Categorical distribution for each item. Label assigned to each item via the transduction. 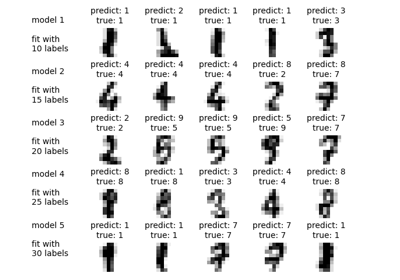 predict(X) Performs inductive inference across the model. predict_proba(X) Predict probability for each possible outcome. All the input data is provided matrix X (labeled and unlabeled) and corresponding label matrix y with a dedicated marker value for unlabeled samples. 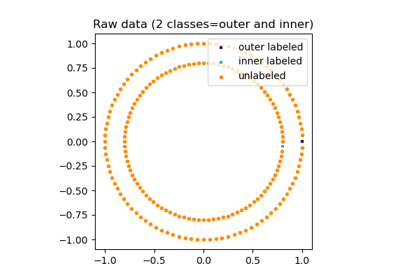 Performs inductive inference across the model. Predict probability for each possible outcome. Compute the probability estimates for each single sample in X and each possible outcome seen during training (categorical distribution).